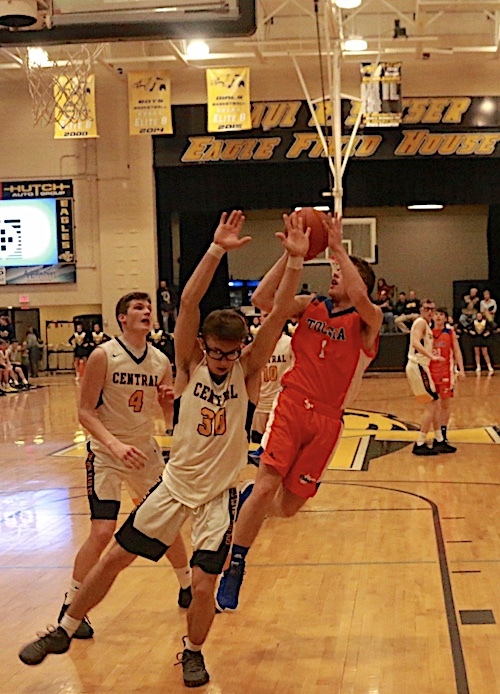 PAINTSVILLE, KY. — Rebounding was the difference as Johnson Central ( 14-4 ) came away with a 40-21 advantage and was victorious 84-76 over Tolsia ( 9-3 ) Tuesday at Eagle Field House. Jacob Mollette continued his hot shooting against Johnson Central Tuesday. Mollette has hit 16 three pointers in 3 games. The Rebels led 22-17 after one quarter and 39-17 behind Jacob Mollette who hit 3 three pointers and scored 16 points. 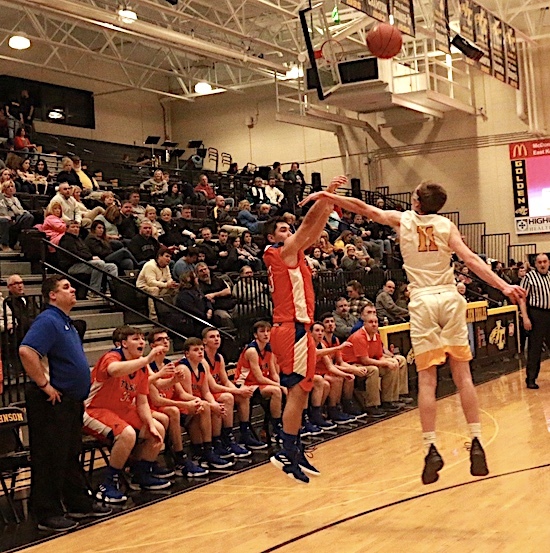 In the second half the Golden Eagles out scored Tolsia 21-14 and led 60-55 going into the final stanza. In the fourth Johnson Central tried to pull away a couple different times but the Rebels kept firing away from three and kept it within striking distance before falling in the end. Gavin Meadows absorbs the contact and makes the bucket vs Johnson Central. Jacob Mollette led the Rebels with 24 points on 9-13 shooting including 5-9 from behind the arc and 3 steals, Gavin Meadows tallied 15 points, 5 assists and 3 rebounds off the bench, Jesse Muncy went 3-4 from three land and finished with 14 points, 5 assists and 3 steals, Tyler Johnson netted 10 points, 5 assists and 3 steals, Zack Ball had 6 points and 4 boards off the bench, Austin Salmons had 5 points and team leading 5 rebounds, Rob Cantrell chipped in with 2 points and 3 rebounds. Tyler Johnson finishes the layup after a sweet behind the back pass from Jesse Muncy. Tolsia went 13-21 from three point distance but only 7-14 from the charity stripe. Johnson Central finished with four in double figures led by Isaiah May with 21, John King 20, Cory Vanhoose 19, Jacob Rice 18, Braxton Bentley, Grant Rice and Bryson Hackney had 2 points each. Johnson Central hit 19-26 from the free throw line and 5-22 from behind the three point line. 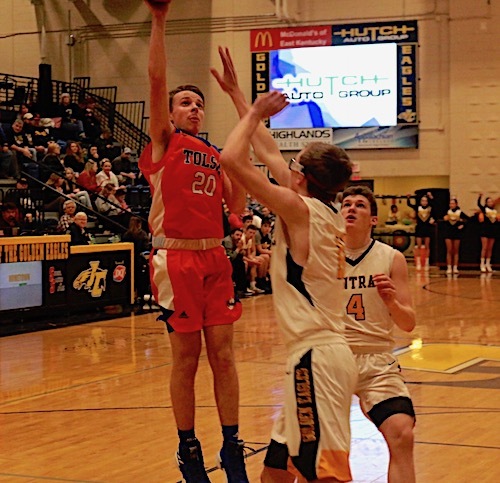 Tolsia will return to action Friday night as they continue Pool play in the West Virginia Hometown Invitational Tournament at Rebel Arena vs Buffalo and then make the trip to Louisa vs Lawrence Co. Saturday night at 7:00. Johnson Central will host Cross Lanes Christian from West Virginia.